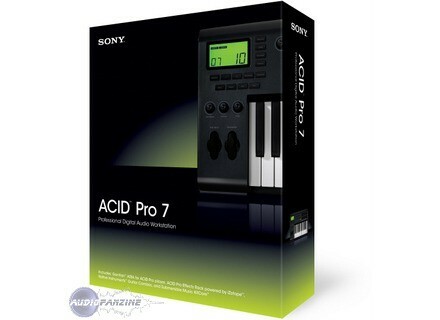 Sony Creative Software has updated ACID Pro to v7.0b. Plug-In Manager performance has been improved. Performance has been improved when working with projects that contain many MIDI loops. An Enable multithreaded soft synth playback check box has been added to the Audio Device page in the Preferences dialog. Select this check box if you want ACID to use multiple processing threads for playing soft synths. On multicore/multiprocessor computers, this setting is designed to significantly increase performance during playback and real-time rendering. Clear the check box if you're using a single-core processor or if you're using soft synths that do not support multithreaded rendering. 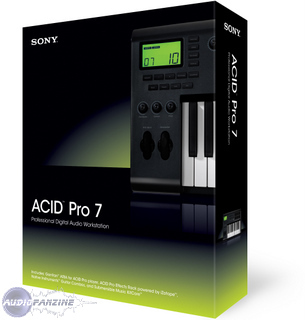 ACID can now render to Advanced Audio Coding (AAC) format. In the Render As dialog, choose Fraunhofer AAC from the Save as type drop-down list. If your project contains a video track, you can render the audio portion of your project as AAC using the Main Concept codec. In the Render As dialog, choose MainConcept AVC/AAC from the Save as type drop-down list. The Main Concept codec is not available unless your project contains a video track. Keyboard shortcuts have been added for common Mixing Console functions. You can now set Mixing Console channel strip widths by choosing a command from the channel strip shortcut menu. Fixed a bug that could cause ACID to hang when adding or routing busses in 5.1 surround projects. Fixed a bug that prevented MIDI clips from being exported from the Clip Properties window. Fixed a bug that could cause audio to drop out when using the ExpressFX Dynamics plug-in. Fixed a bug that discarded marker, section, and region information when rendering to WMA or WMV formats. Fixed a bug that caused stretch markers to be duplicated when reloading a loop. Fixed a bug that prevented mute envelopes from being displayed properly on MIDI tracks. The cursor no longer lands between markers when jumping through areas with tempo curves. Pitch shifting a single audio event no longer pitch shifts the entire track. Fixed a bug that caused audio to be rendered improperly when the Sound Forge Wave Hammer plug-in was assigned to the ACID master bus. Plogue Bidule Update Plogue has updated Bidule to v0.9685. Precision Sound Retro Gadgets Vol. 4 Precisionsound has released Retro Gadgets Vol. 4, continuing the SampleSet series. Sonic Visualiser Updated To v1.5 Sonic Visualiser has been updated to v1.5.